Looking for the Best Fan for Tent Camping? To select just one fan as the best fan for camping, we recommend the Geek Aire Rechargeable Outdoor Floor Fan. It has a good number of features that allow it to hold up well to the outdoors. For one thing, it has anti-slip rubber feet so it won't fall over in the tent. The metal frame is durable, and it is overall resistant to some water exposure. As for the airflow, it may not offer the widest of coverage, but it provides a powerful enough breeze that can satisfy individuals in a small or medium-sized tent. It charges well, holds a battery life that can last days, and the fan is adjustable 120-degrees. This fan even has a USB port to charge devices. When you're camping during warmer or outright hot weather, a muggy tent can ruin the otherwise enjoyable camping experience. Sometimes, the windows and ventilation system in the tent just doesn't cut it. That's where a tent fan comes in. If you need some help finding the best camping fan, then reading our reviews of our recommended top five products should give you a better idea. We've considered the benefits of each product as well as some of their drawbacks to provide you with an overview of which fans perform best for any given situation. However, before we get into the reviews, let's go over what to look for in a tent fan, which features are essential, and other useful details. When you're deciding what to bring with you on a camping trip, if you know the weather's going to get hot, a camping fan may be a great inclusion on the list. Finding the best camping fan isn't always easy, so we put together some features you should consider when shopping for one. This includes type, size, the power behind it, durability, and more. Types of Tent Fans: Hanging or Stand-Up? When it comes to camp fans to use on your camping trip, there are two main types to choose from: hanging and stand-up. Which type you decide to get depends mainly on how you plan to use it. For starters, hanging fans act similar to ceiling fans. These tend to work well in larger tents with an open plan inside. This is because by having the fan hanging, air is circulated from above, which allows the coolness to reach a wider area of the tent. Take caution, however, as this type doesn't work well in all shelters. Depending on the strength of your tent, make sure to choose one that isn't liable to be so heavy to cause it to collapse inwards. As for stand-up tent fans, they usually have a broad base so that you can set it up anywhere you need it to be. It's quicker to install than a hanging fan due to their simplistic nature. On the other hand, they don't circulate as well as hanging fans as they generally send cool air in a single direction. It can take some time for a stand-up fan to circulate throughout the entire tent. Tent fans are typically powered using an AC adapter or batteries. There are even some that can be used both ways. With an AC adapter, you may benefit using it if you're looking for an extended camp stay. Although, it'll only work if there's electricity at your campsite or you have brought a generator (or some other power supply). If you have a tent with electrical port access, you can use it to supply power to your fan. As such, it is more common to find camping tent fans powered using batteries than with an AC adapter. Most of them can last for a few hours, but if you're planning on an extended stay, then you'll be better off bringing a good amount of replacement batteries. Deciding on size may be based on the type of tent you have and how much it can handle. For example, if you have a smaller or average-sized tent and decide on a hanging fan, then you want something smaller that doesn't weigh much. They're naturally bulky, so focus more on the weight to make sure it doesn't collapse the tent. If you have a backpacking tent, then it'll serve you best to go smaller. This way, you aren't weighed down by carrying the tent, the fan, and other accessories. Stand-up fans may be better in this case. Always check on the type of shelter you have when determining what size fan to go for. Camping can be a rough experience, so you want a tent fan that can withstand a lot of the hardships that comes with the outdoors. If it breaks down on a hot night, your otherwise fun camping trip can take a stuffy and uncomfortable turn. So, you need a tent fan made from quality materials. The noise coming from a tent fan can vary just like any other type of fan. More than likely, you'll use your fan as you sleep. If noise is not a factor, then you can purchase any tent fan that suits your needs. If however, you are a light sleeper and any noise will likely disturb you, then you may consider opting for a fan with plastic blades. These are generally quieter than metal bladed models. Another thing to look for that can affect the noise is the speed of the fan. Higher speeds usually mean more noise. There are multi-speed fans that allow you to adjust according to your needs. These can be preferable to give you more control over the noise as well. Some tent fans are designed with additional accessories that can make them more enjoyable to use. For one thing, some have built-in lighting that can enhance your nighttime use. Other fans are designed with USB ports. Some of the ports can be used to recharge the fan, while others can be used to recharge your own devices such as a smartphone. It isn't necessary for a tent fan to have these accessories, but you can consider them concerning your personal needs. Image Portable LED Camping Lantern with Ceiling Fan is a versatile tent fan that can satisfy more than one need. For one thing, the fan has two speeds to choose from: high and low. You can adjust according to what you need at the time, and on low-speed, it makes a minimum amount of noise as to not disrupt your sleep. In addition to that, the fan is made with LED lens to provide lighting at night. It has a 360-degree adjustable lens so that you can change the angle of the light to suit your purposes. More so, it does well at lighting up an entire small or medium-sized tent. This fan features a hook on the top. As such, it is a hanging-style tent that can push a decent amount of air around. A D battery powers this, and one is known to last more than 15 hours in high-speed and approximately 20 hours with the light. It doesn't come with a battery, so you must purchase one before use. 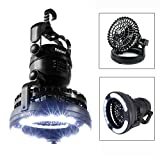 The Image Portable LED Camping Lantern with Ceiling Fan is perhaps the best tent fan with optimal lighting that you can use so you can stay cool and maybe get some reading in at night. 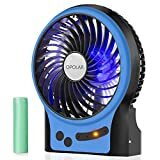 OPOLAR Battery Operated Rechargeable Fan is designed with multiple power supply options for a good amount of power versatility. You can allow it to run on Li-ion batteries that can give you more than six hours of runtime. If you have a computer, you can connect to it using the USB port. This can even be powered using a wall adapter. For those looking for something quiet, even with the metal frame, this makes a minimal amount of noise. It allows you to rest in relative peace as it's noted to make a noise that is less than 40dB. This is most ideal for those of you who may be light sleepers. You can adjust the frame up and down by 360-degrees. This allows you to better control the wind direction to match your position. It doesn't cover the entire tent, however, but it is ideal for use as a personal fan. With the O2COOL 10-inch Portable Camping Fan, you have something that is compact, which may be perfect for use in a backpacking tent. There is still enough weight to it though that you won't have to worry about it falling over while it's in use. To make traveling with it more manageable, it comes with a built-in carry handle. The fan has two speeds, high and low, which are easy enough to adjust. The blade design is intended to be energy efficient so that you can extend the battery life. It does require six batteries to run. However, if you run out, it is designed to be used with a power adapter that, unfortunately, does not come with the product. This is another tent fan with the added accessory of having LED lights. There are three settings on it: high, low, and nightlight. These lights are also able to rotate so that you can have options in how you illuminate your tent. The O2COOL 10-inch Portable Camping Fan is one of the best compact fans with LED lighting that is also adjustable to suit your needs. Using the Comlife Battery Operated Clip-On Portable Fan, you can have a versatile machine that can do more than keep you fresh. With its USB port, you can charge up some of your devices such as your cell phone while you relax in your tent. This is done by using the fan's power source. 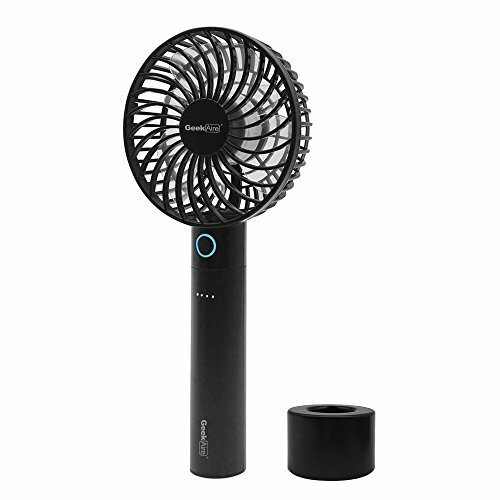 Concerning the power to the fan, it's battery-operated and rechargeable. You can even use the USB connection to hook up to a computer and recharge that way. Depending on how much you use it for, the fan can provide over six hours of working life. However, the more you use it for other things, the more frequently you may have to recharge or replace the batteries. It utilizes a brushless motor that offers high speeds at a low noise level. As for where you can use it, it has a clip-on design so that you can position it however you need it. It has 360-degree rotation both vertically and horizontally. Also, you can even use it as an aroma fan if need be. The Comlife Battery Operated Clip-On Portable Fan is the fan to use if you want something with the most portability and various functionalities thanks to the USB port. Geek Aire Rechargeable Outdoor Floor Fan is rechargeable and runs on Li-ion batteries. The runtime of the batteries depend on use, but it can last more than a day without using the highest speed. It comes along with a 24V power charger. Also, it features a USB port you can use to charge cell phones and other devices. There is only a single knob to control the fan, but it's easy enough to use. For adjustability, the fan is designed to angle 120-degrees at a tilt. So that you don't have to worry about it falling, it features anti-slip rubber feet. Concerning airflow, it can deliver high-performance, optimal in small or medium-sized tents. There is an LED battery gauge indicator so that you're always aware if you need to recharge. Also, the fan is designed explicitly rugged for outdoor use, and it even holds up well against water if it's ever exposed. 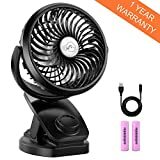 The Geek Aire Rechargeable Outdoor Floor Fan is one of the most durable camping fans thanks to it being waterproof and having a sturdy frame.